Antique brass finish accents adds sophistication to this oil-rubbed bronze finish four-light track fixture. Four vintage style Edison lights are ensconced in rich, oil-rubbed bronze, offering a glamorous, modern flair. Adjustable light heads allow for perfect positioning, making this track light fixture ideal for living rooms, family rooms, and more. 30" wide. With bulbs is 15 3/4" high. Canopy is 5" wide x 1" high. Weighs 7.50 lbs. Bar to socket is 3" high. Stems are adjustable from 2" to 5 1/4". Comes with four 60 watt E26 base Edison style decorative bulbs. Maximum 60 watt bulbs. Adjustable four-light track fixture from the Henning collection by Pro Track®. Adjustable light heads swivel 180 degrees each way. 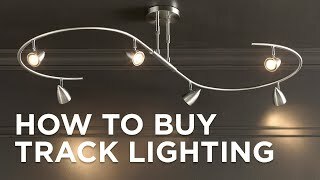 Lights can be adjusted as desired to direct light or achieve a decorative look. Oil-rubbed bronze finish canopy. Warm antique brass bar and accents. Can you use LED bulbs with this light? BEST ANSWER: The lights have regular sockets, so any kind of screw in bulb will work. The bulbs that come with it are very nice though. I would like to install this in a sloped ceiling. Can i make it work? It appears the lights can be moved in various directions. BEST ANSWER: Hi, the heads swivel but the vertical rods do not have a swivel for a sloped ceiling. can it be mounted on a sloped ceiling? BEST ANSWER: Hi, the light does not have a swivel to adjust to the slope of the ceiling. another question ..... are they dimmable? BEST ANSWER: Hi – the included Edison style bulbs are dimmable with any standard line voltage dimmer. are they suitable for u.k. electrics/240 volt? BEST ANSWER: Hi - Our products are made in the standard USA 110V electrical system requirements. Items with cords and plugs use Type A or Type B North American plugs. Please check with a certified electrician in your country/area if our products can be used/installed. Can it be extended, to be longer, another section? BEST ANSWER: Hello - Unfortunately, this track fixture cannot be extended. Our apologies! Can this be attached to a wall? BEST ANSWER: Yes, the light can be mounted onto a wall.